1. 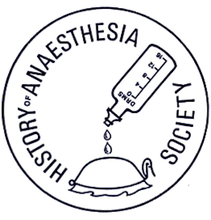 The SOCIETY shall be called THE HISTORY OF ANAESTHESIA SOCIETY. a. “The Society” means The History of Anaesthesia Society. b. “The Council” means the Council for the time being of the Society. d. Words importing the masculine gender include the feminine gender, and the singular includes the plural and vice versa. 3. The AIMS and OBJECTS of the Society shall be to promote the study of the history of anaesthesia and related disciplines and to provide a forum and social ambiance for discussions amongst members. Ordinary Members: any person who is over eighteen years of age and who is interested in the study of the History of Anaesthesia is eligible to be nominated and, if approved under Rule 5, elected to Ordinary Membership. Honorary Members are elected from amongst eminent persons. These may have made an exceptional contribution to the study of the history of anaesthesia, the History of Anaesthesia Society or may be others whom the Society specifically wishes to honour. Candidates for election as ordinary members shall be approved by Council on receipt of the correctly completed application form and shall be in good financial standing with the Society. Honorary Members shall be elected at the Annual General Meeting on the nomination of Council, and will have voting rights. No ordinary Members shall enjoy the privileges of membership, including voting rights, until he has paid his annual subscription and any arrears due. The rights and privileges of every member are personal to himself and cannot be transferred or transmitted. a. If by notice to the Honorary Secretary of the Society he resigns his Membership. b. If he ceases to be a member under Rule 13.
c. If he is expelled from Membership under Rule 8. If in the opinion of Council it is considered that it is in the interests of the Society that a member should be invited to withdraw from the Society, a written notice should be sent to the member by a “recorded delivery” asking him to resign within a specified time or, in default, to submit the question of his expulsion to an Special General Meeting to be held within six weeks of the date of such notice. At such a meeting the member whose expulsion is under consideration shall be allowed to offer an explanation of his conduct verbally or in writing, but if three-fourths of the members present shall vote for his expulsion he shall cease to be a member of the Society. The voting at any such a Special General Meeting shall be by ballot if not less than five members present shall so demand. Ten Members in addition to any Officers present shall constitute a quorum at such meetings. There shall be an Annual General Meeting. The Annual General Meeting shall be held in each financial year on a date and at a place to be fixed normally at the previous Annual General Meeting. Notice of the Annual General Meeting shall be sent to all Members at least one month before the date of that meeting. Notice of the Annual General Meeting will be posted on the Website. Ten Ordinary Members in addition to any Officers present shall constitute a quorum at each Annual General Meeting. The President will normally take the Chair unless he delegates otherwise. If he does not take the Chair, this will be taken in order of precedence by the Vice President, the Honorary Treasurer, the Honorary Secretary, and other duly elected Officer elected under Rule 15 or an Ordinary Member elected by the Meeting. f. Such other business as Council may decide. Decisions shall be taken by a majority of those casting their vote unless the meeting determines otherwise by resolution. The Chairman of the Meeting shall have a casting vote in the case of an equality of votes. Any member wishing to move any Resolution at the Annual General Meeting shall give notice thereof in writing to the Secretary not less than ten working days before the Meeting. Special General Meetings may be called from time to time by Council. Also the Secretary shall call a Special General Meeting within six weeks from the receipt of a requisition signed by at least ten members stating the purpose for which the meeting is to be called. At a meeting called by requisition no other business shall be considered beyond that referred to in the requisition. Ten Members in addition to any Officers present shall constitute a quorum at such meetings. Every Member present and eligible shall have one vote either in a show of hands or in a ballot. The Annual Subscription shall be payable in advance and become due on 1st July each year. The Annual Subscription for Members for the next ensuing year shall be determined by resolution at each Annual General Meeting. Honorary Members will not pay any subscription. New members shall pay that year’s annual subscription on election and sign a Bankers Order for future payment of subscription. The Honorary Treasurer may make other arrangements at his discretion for overseas members. The period for which subscriptions should be paid in advance must not exceed five years, except at the discretion of the Honorary Treasurer. An Ordinary Member whose subscription is SIX months in arrears, and who has been duly notified by “recorded delivery”, shall cease to be a member of the Society. He may be reinstated on payment of arrears and with the consent of the Council. It shall be the duty of the members to notify the Secretary in writing of any change of address. Every notice to resign under Rule 7 shall be deemed to take effect from such notice of resignation, but all arrears of subscriptions must be paid on giving notice. The Officers of the Society shall normally consist of a President, a Vice President, who shall normally be President elect or the Immediate Past-President, an Honorary Treasurer and Membership Secretary, an Honorary Secretary and an Honorary Editor of the Society’s Proceedings. When required, the Honorary Treasurer and Membership Secretary may be split into two separate roles. An Honorary Treasurer Elect, an Honorary Secretary Elect and an Assistant Editor may also be elected from time to time if needs demand. All Officers are elected annually at the Annual General Meeting of the Society. a. The President shall normally be proposed for election as Vice President from among Ordinary Members of the Society on the nomination of Council at the Annual General Meeting one year before the Annual General Meeting at which he is due to be installed as President. The President shall normally hold office for two years, but may continue for a third, then sit on the Council for one or two years after, as Immediate Past President. If the Vice President is unable or unwilling to assume the Office of President, Council shall propose a suitable person from amongst the Ordinary Members for election as President. b. The Honorary Treasurer and Membership Secretary shall be proposed for election from among Ordinary Members on the nomination of Council. He shall hold office for one year, and shall be eligible for re-election annually at the AGM, normally for up to six years. When required, there may be elected two separate officers for this role: the Honorary Treasurer and an additional Honorary Membership Secretary. c. The Honorary Secretary shall be proposed for election from among Ordinary Members of the Society on the nomination of Council. He shall hold Office for one year and shall be eligible for re-election annually at the AGM, normally for up to six years providing that this does not result in a change of both President and Honorary Secretary at the same time. d. The Honorary Editor shall be proposed for election from among Ordinary Members by Council as occasion demands. The Editor shall hold office for one year and be eligible for re-election annually at the AGM, normally for up to six years. e. The Honorary Treasurer Elect and the Honorary Secretary Elect shall be proposed for election from among Ordinary Members by Council as occasion demands. They shall hold office for one year and be eligible for re-election annually at the AGM, normally for up to six years. f. The names of persons nominated as Officers shall be circulated with the agenda of the Annual General Meeting. The business of the Society shall be conducted by a Council consisting of The President, The Vice President, The Honorary Treasurer, The Honorary Secretary, The Honorary Editor and such other Officers as may be elected by the Annual General Meeting under Rule 15, and eight Ordinary Members. Normally there shall be no more than one vacancy. New Council members will be elected at Annual General Meetings. They can be nominated by a Member of the Society or self-nominated. All nominations must have a proposer and seconder, and election will be by the Members at that meeting either by a show of hands or by ballot. Ordinary Members of Council shall hold office, in the first instance for three years but, may hold office for a maximum of five years following approval at an Annual General Meeting. Just as Council shall have power to co-opt as members, or invite as observers, persons whose advice would be likely to assist the deliberations of Council they should also be empowered to nominate retiring Officers or Members to serve in another capacity. Council may act notwithstanding vacancies on its body. b. a medical report is received confirming him to be of unsound mind. 18. The Society may from time to time vary the number of Council members by resolution at an Annual General Meeting. 19. Council may meet together for dispatch of business, adjourn and otherwise regulate their meetings and proceedings as they think fit. Four members of Council including at least one officer shall constitute a quorum. Exceptionally, urgent business may be conducted by five such Members by post, telephone, fax or email. 20. Ordinary Meetings of Council shall, unless the President otherwise directs, be held at least twice each year. The President or Chairman of Council for the time being (Rule 9 fourth paragraph) may at any time, and on the requisition in writing of two Council members stating the purpose for which the meeting is to be convened, convene a special meeting of the Council. A clear seven days notice stating the purpose of a special meeting shall be given to Members of Council. No member of Council shall be entitled to a notice of a Special Meeting of Council while absent from the address which is registered by the Society. The Council shall have the power to appoint Standing or other Committees or Sub-Committees as necessary to consider any appropriate matter and report to Council. Any members of the Society may be appointed to these Committees. The President, Vice President, Honorary Treasurer and Honorary Secretary shall be entitled to attend all Committees unless Council or the Annual General Meeting determines otherwise. In case of emergency the Chairman of Council or of a Committee may take such immediate action as may seem necessary to him and shall report the matter to the next meeting of Council or the appropriate Committee. The meetings and proceedings of any Committee appointed by Council shall be governed by the provisions contained in the Bye-laws for regulating the proceedings of Council so far as these are applicable. A resolution in writing signed by all Members of Council shall be as valid and effective as if it had been passed at a meeting of Council duly called. Council shall cause Minutes to be duly recorded and kept by the Society. These should include the names of all the Officers and Members of Council present at each meeting of Council and at any meeting of a Sub-committee of Council. They should also include the orders made or directions given by the Council and Sub-committee of Council and all resolutions and proceedings of General Meetings of the Society. Any such Minutes of any meetings of Council or of any Sub-committee or of the Society signed by the President or Chairman for the time being shall be receivable as prima facie evidence of the matters stated in such Minutes. Council shall have discretion to reimburse members for expenses incurred in the services of the Society or to remunerate other persons who assist the Council from time to time. The Society will maintain the current policy of not paying Travel Expenses when Council meets in association with a scientific meeting. Payment of a reasonable rate for attendance at separate Council Meetings will be considered by Council. •Accommodation charges will not normally be reimbursed. Council shall cause true accounts to be kept of all sums of money received and expended by the Society and the matters in respect of which such receipt and expenditure shall take place and of the assets, credits and liabilities of the Society. The book of Accounts shall be kept in such place or places as Council thinks fit. The financial year of the Society shall end on the last day of March in each year, to which day the accounts of the Society shall be balanced. As soon as practicable after the end of each financial year the account shall be checked by an accredited Accountant appointed by the Annual General Meeting. The independent examination of such accounts shall be completed before the Annual General Meeting. Subject to any reasonable restrictions as to the time and manner of inspecting the accounts that may from time to time be imposed by the Society at General Meetings, the books and accounts of the Society shall be open to inspection of the Members at all reasonable hours. At the Annual General Meeting in every year Council shall present to the Society a balance sheet containing a summary of the property and liabilities of the Society made up to the end of the last financial year. The Honorary Treasurer, or his nominated deputy, shall, then, make a Report and seek the approval of those Members present. At the Annual General Meeting each year the Honorary Secretary, or his nominated deputy, will read a Report of the work of Council in the preceding year. All deeds and documents shall be executed and signed by two members of Council and countersigned by an Officer. These rules may be added to, amended, or repealed by Resolution at any General Meeting of the Society provided that no such Resolution shall be deemed to have been passed unless it be carried by a majority of at least two-thirds of the members voting thereon. Notice of any proposal to repeal, amend or add to existing rules must be sent to the Honorary Secretary in writing no later than one month before the Annual General Meeting and must appear on the Agenda of the said meeting in the form of a motion which shall be issued not less than fourteen days before the meeting. Any secretary or other officer or servant of the Society whether honorary or otherwise shall be indemnified by the Society of claims against it and it shall be the duty of Council out of its funds to pay all costs, losses and expenses which any such officer or servant may incur or become liable for by reason of any contract done by him in the proper course of his duties as such officers or servants or in any way in the discharge of his duties. No members of Council or other Officer of the Society whether honorary or otherwise shall be liable for the acts, receipts, neglects or defaults of any other like member or officer or for joining in any receipt or other act of conformity or for any loss or expense happening to the Society through the insufficiency or deficiency of any security in or upon which any of the monies of the Society shall be invested or for any loss or damage arising from the bankruptcy, insolvency or tortuous act of any person with whom any monies, securities or effects shall be deposited or for any loss or damage occasioned by any error of judgment of oversight on his part or for any other loss, damage or misfortune whatever which shall happen in the execution of the duties of his office or in relation thereto unless the same shall happen through his own dishonesty or wilful neglect or default. The Council shall from time to time make repeal and amend such Bye-laws and Regulations (not inconsistent with the Rules) as they shall think expedient for the internal management and well being of the Society. All Bye-laws and Regulations made by Council under this rule shall be binding upon members until repealed by Council or set aside by Resolution of a General Meeting of the Society. All new Bye-laws shall be approved at the next Annual General Meeting by a two-thirds majority after fourteen days prior notice. A Directory of Members shall be kept by the Honorary Treasurer and Membership Secretary by whatever means shall be most convenient to the Society not excluding electronic data processing. It is incumbent on each Member to ascertain that his name and address and other particulars are correctly entered therein.